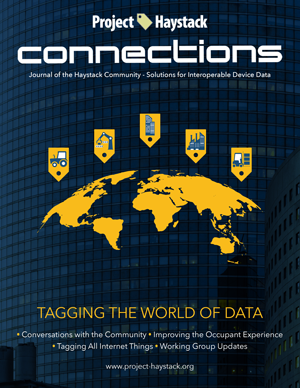 The Spring 2018 issue, which is our fourth issue, of the Project Haystack Connections Magazine is published! It is growning in readership as the industry comes to understand the mission of the Project Haystack Organization and the importance of making it easy to work with the data produced by smart, connected devices and equipment systems. Project Haystack Connections Magazine SPRING 2018 The theme is 'Tagging the World of Data' and this issue contains interviews with a good sampling of Haystack Tagging end-users from the ranks of design engineers, commissioning experts, smart building consultants, and large-portfolio property managers. Their stories document how fast the evolution toward smarter buildings and connected systems can happen once building operational data has been tagged. You will also find an analyst interview and contributed articles about deployments and tagging concepts and activities from Australia to the Nordics. Around the DDC world, people are recognizing that metadata tagging is key to clearing hurdles related to ease-of-use, unified data flow, edge-to-cloud, data security and even adhering to the new GDPR data privacy rules. Read about it first in the Spring 2018 edition of Project Haystack Connections Magazine. We want to thank the whole Project Haystack Community for their contributions to our success.